Construct the corresponding SubProcess object if it hasn't been done before. Return the momenta of the partons to be used by the matrix element object, in the order specified by the TreeDiagram objects given by the matrix element. Access the random numbers used to generate the last phase space point, if the matrix element requested so. Return the parton types to be used by the matrix element object, in the order specified by the TreeDiagram objects given by the matrix element. Set a diagram to be used instead of the one selected by the matrix element. Set the last selected diagram. Set the PDF weight used in the last call to dSigDR. Set the cross section calculated in the last call to dSigDR. Set the last jacobian obtained when generating the kinematics for the call to dSigHatDR. Set the last preweight factor. Constructor given a head xcomb. Constructor used by MEBase to create a temporary object to store info. Properly setup the PartonBinInstance objects provided a sub process has been constructed using this XComb. Fill the variables needed to generate remnants; momenta will be used from the partons set in this xcomb, but random numbers need to be provided to (re)generate variables not fixed by the incoming partons. Fill phase space information as far as possible. Access the assigned objects used in the generation. The matrix element to be used. Set the head XComb pointer. Return a selector object of xcombs to choose subprocesses different than the one currently integrated. Return a pointer to a projector xcomb which will generate a subprocess different from the one just integrated. Set a pointer to a projector xcomb which will generate a subprocess different from the one just integrated. Main functions used for the generation. Try to determine if this subprocess is at all possible. The number of dimensions of the phase space used to generate this process. Return the parton extraction dimensions. Return true, if the current configuration will pass the cuts. Return the cut weight encountered from fuzzy cuts. Reset all saved data about last generated phasespace point;. Return true, if kinematics have already been generated. Indicate that kinematics have been generated. Generate a phase space point from a vector r of nr numbers in the interval ]0,1[ and return the corresponding differential cross section. Return the PDF weight used in the last call to dSigDR. Return the cross section calculated in the last call to dSigDR. Check if a reshuffling is required when constructing the hard subprocess. Return true if a reshuffling is required when constructing the hard subprocess. Perform the reshuffling from hardProcessMass to mass values, given outgoing momenta. Construct a sub-process object from the information available. Functions used for collecting statistics. The statistics object for this XComb. Accept the current event assuming it was previously selcted. Reweight a selected and accepted event. Access information used by the MEBase object. The diagrams used by the matrix element. True if the TreeDiagram's for this matrix element should in fact be mirrored before used to create an actual sub-rocess. Return the last selected diagram. Return the index of the last selected diagram. Get information saved by the matrix element in the calculation of the cross section to be used later when selecting diagrams and colour flow. Set information saved by the matrix element in the calculation of the cross section to be used later when selecting diagrams and colour flow. Return the random numbers used to generate the last phase space point, if the matrix element requested so. Return the coupling factor as calculated for the lats phase space point. Set the local parton bin info objects for this XComb. Create PartonBinInstance objects for this XComb. Set the pair of incoming particle instances. Set information about currently generated partons. Return a reference to the corresponding collision handler. Return a pointer to the corresponding collision handler. A pointer to the parton extractor. A pointer to the kinematical cuts. Return a possibly null pointer to a CascadeHandler to be used for CKKW-reweighting. Additional information about the incoming partons. The maximum cm energy for this process. Prepare this XComb for producing a sub-process. Return the pair of incoming particle instances. Set the pair of incoming parton instances. Set the SubProcess object corresponding to the last generated sub-process. Return the corresponding parton bin instance for a given extracted parton. Set the last generated total energy squared of the incoming particles. The last generated total energy squared of the incoming prtons. Set the last generated total energy squared of the incoming prtons. The last generated rapidity of the hard scattering sub-system. Set the last generated rapidity of the hard scattering sub-system. Get the last chosen scale of the hard scattering. Set the last chosen scale of the hard scattering. Get the last chosen central scale of the hard scattering. Set the last chosen central scale of the hard scattering. Get the last chosen shower scale. Set the last chosen showr scale. Set the used in the hard scattering. The number of dimensions of the phase space used for each of the incoming partons. Calculate the reshuffling equation given the coefficients. Solve the reshuffling equation given the coefficients. Statistics gathering for this XComb. True, if kinematics have already been generated. The momenta of the partons to be used by the matrix element object, in the order specified by the TreeDiagram objects given by the matrix element. The parton types to be used by the matrix element object, in the order specified by the TreeDiagram objects given by the matrix element. A diagram to be used instead of the one selected by the matrix element. The last selected tree diagram. Information saved by the matrix element in the calculation of the cross section to be used later when selecting diagrams and colour flow. The random numbers used to generate the last phase space point, if the matrix element requested so. The PDF weight used in the last call to dSigDR. The cross section calculated in the last call to dSigDR. Save the last jacobian obtained when generating the kinematics for the call to dSigHatDR. A selector object of xcombs to choose subprocesses different than the one currently integrated. A pointer to a projector xcomb which will generate a subprocess different from the one just integrated. True, if cuts have already been checked. The result of the last call to willPassCuts. The cut weight encountered from fuzzy cuts. True if a reshuffling is required when constructing the hard subprocess. The StandardXComb class inherits from the more general XComb class which stores all information about the generation of a hard sub-proces for a given pair of incoming particles, a pair of extracted partons, etc. 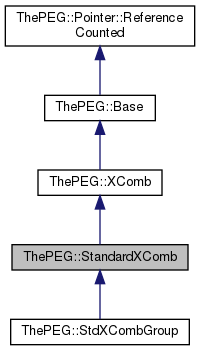 This class stores more information related to thestandard process generation scheme in ThePEG, such as the PartonExtractor and MEBase object used. It also does some of the administration of the process generation. The main function is dSigDR() which returns the differential cross section w.r.t. a given vector of random numbers in the interval ]0,1[. In the initialization this is used to pre-sample the phase space. In the generation phase it is used to give the cross section for a phase space point, and if this StandardXComb is chosen the construct() function is called to generate the actual sub-process. Definition at line 53 of file StandardXComb.h. Definition at line 61 of file StandardXComb.h. A vector of DiagramBase objects. Definition at line 58 of file StandardXComb.h. If this XComb has a head XComb, return the cross section differential in the variables previously supplied. The PDF weight is taken from the lastPDFWeight supplied by the head XComb object. Return a pointer to the head XComb this XComb depends on. May return NULL, if this is not a member of a XComb group. Definition at line 159 of file StandardXComb.h. Definition at line 395 of file StandardXComb.h. Set the matrix element squared as calculated for the last phase space point. Definition at line 483 of file StandardXComb.h. Definition at line 407 of file StandardXComb.h. Set the partonic cross section as calculated for the last phase space point. Definition at line 495 of file StandardXComb.h. Definition at line 415 of file StandardXComb.h. Set the PDF weight as calculated for the last phase space point, if the matrix element does supply PDF weights. Definition at line 503 of file StandardXComb.h. Reject the current event assuming it was previously accepted. If weighted events are produced, the weight should be the same as the previous call to select(double). Definition at line 314 of file StandardXComb.h. It will later be rejected with a probability given by weight. Definition at line 295 of file StandardXComb.h. Setup information on incoming partons depending on the information previously supplied through the choice of diagram and incoming momenta in the first two entries of meMomenta(). Partons are not actually extracted from the incoming particles, though a subprocess detached from the current Event may be created. Return a pointer to the corresponding sub-process handler. May be null if the standard process generation in ThePEG was not used. Definition at line 147 of file StandardXComb.h. MEBase needs to be a friend. Definition at line 64 of file StandardXComb.h. A pointer to the head XComb this XComb depends on. Definition at line 673 of file StandardXComb.h. The matrix element squared as calculated for the last phase space point. Definition at line 641 of file StandardXComb.h. The partonic cross section as calculated for the last phase space point. Definition at line 653 of file StandardXComb.h. The PDF weight as calculated for the last phase space point, if the matrix element does supply PDF weights. Definition at line 661 of file StandardXComb.h.